Jenna Coleman is an English actress best known for her role as Clara Oswald in the British television series Doctor Who. Born in Blackpool, Lancashire, England, Coleman began her acting career at an early age as a member of a theatre company called In Yer Space. While auditioning for drama schools, Coleman was chosen to play Jasmine Thomas in Emmerdale. Her performance garnered much critical acclaim and was nominated for the Most Popular Newcomer award at the 2007 National Television Awards. She went on to other roles in successful BBC productions including Lindsay James in the school-based drama series Waterloo Road, Susan Brown in an adaptation of the John Braine novel Room at the Top, Annie Desmond in Julian Fellowes' four part mini-series Titanic, and Rosie in Stephen Poliakoff's original drama series Dancing on the Edge. She also appeared as Lydia Wickham in the BBC drama Death Comes to Pemberley. Marvel comics fans will also recall Coleman as Bucky's girlfriend in the hit film Captain America: The First Avenger. Not a stranger to voice over roles, Coleman provided the voice for the character Princess Melia Antiqua in the English dub of the 2011 Nintendo Wii exclusive Xenoblade Chronicles. In 2012, Coleman was cast as Rosie in the drama series Dancing on the Edge, which follows the fortunes of a black jazz band in the 1930s. In 2012, Coleman began her tenure as the eleventh Doctor's companion on the long running BBC series Doctor Who. Sworn to secrecy during the audition process, Coleman would refer to the project only as Men on Waves (an anagram for "Woman Seven") when asked what she was auditioning for. Producer Steven Moffat remarked that one of the primary reasons Coleman landed the coveted spot was because of the chemistry she shared with Smith and her innate ability to talk faster than him during scenes together. Coleman's first appearance as The Doctor's companion was originally planned to happen on the 2012 Christmas special however she made a surprise appearance earlier than expected, playing a relative of her character Clara Oswald, Oswin Oswald. Oswin subsequently died later in that particular episode and appeared again as her own distant relative in the episode, "The Snowmen." Her final incarnation as Clara Oswald was introduced in the episode, "The Bells of Saint John," where she carried on as The Doctor's regular companion, continuing on in her role as companion when current Doctor Peter Capaldi stepped into the role. 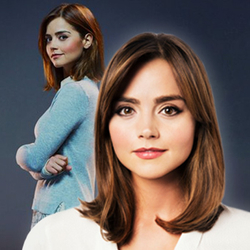 Her run as Clara Oswald concluded in 2015 with the show's 9th series. In 2016, Coleman was seen in the television drama Victoria as Queen Victoria. Chronicling the early life of the Queen from her accession to the throne to her courtship with Prince Albert, the series aired to rave reviews on ITV in the United Kingdom. Following the success of the first round of episodes, a second series has been ordered and is currently in production. 2016 also saw Coleman voice a character on the revival of the classic Gerry Anderson supermarionation series Thunderbirds Are Go.